LIBERAL, Kan. – The Seward County Saints basketball team used a career game by Isiah Small to run away with a victory on Wednesday over the Allen Red Devils, 77-48. Small finished with a career-high 25 points and his third career double-double (25 pts/10 rebs). Seward (8-4, 4-4) jumped out to an early 7-0 lead after a quick five points by Small, followed by a Ke’Sean Davis jumper. The Red Devils went on their own 5-0 run over the next two minutes to cut the lead to two, but an Isiah Small alley-oop from Jamel Horton started a 7-2 run to give the Saints an eight-point lead with 12:49 left in the half. Just before the media timeout, Devin Bethely hit a layup to give the Saints an 11-point lead, the largest of the night at that point. Coming out of the media timeout, the Red Devils closed the gap to just four points with a 7-0. Ke’Sean Davis stopped the run with a put back off his own miss to start a 9-0 for Seward. The Red Devils trimmed the lead to 11 points just before halftime, as Seward went in with the lead 36-25. The Saints saw one of their better shooting performances in the first half, connecting on 14 of 32 (43.8%). Seward’s defense lived up to their expectation in the first half, holding the Red Devils to just 27.6 percent from the field. Small led all scorers with 12 points at the break, while Davis led all players with 10 rebounds. Seward came out firing in the second half, with Hegel Augustin and Small both contributed five points as part of a 10-3 run by the Saints over the first two minutes. Seward slowly continued to extend their lead over the next nine minutes. With the score 61-43, the Saints went on a 9-0 run to increase their lead to 27. Their lead capped at 31 points with a minute to play before the Red Devils hit two free throws to make the final deficit 29 points. The Saints shot an even better 47.2 percent from the field in the second half, finishing the game making 31 of 68 attempts (45.6%). 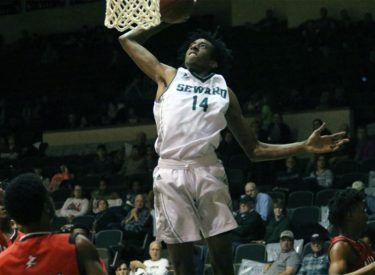 Seward held Allen to 27.8 percent from the floor and 28.6 percent from behind the arc. Once again, the Saints stifling defense proved to be effective, holding the Red Devils offense a 15 percent lower shooting percentage and 30 points under their scoring average. Along with Small, Terrell Alfred (11 pts) and Hegel Augustin (10 pts) scored in the double-figures. Davis ended three-points shy of a second straight double-double, while Augustin came up three rebounds shy of his first career double-double. Seward will play their final game of December on Saturday at 4:00 p.m. when they travel to Neosho County to take on the Panthers. The game airs on B107.5 and kscbnews.net. The Saints will have a month break before their next home game against Independence on January 3.